Should you brush your teeth or floss them? Then answer is that you should do both. Good dental hygiene consists of both brushing and flossing. Ignoring one in order to focus only on the other is not beneficial to your overall oral health. The majority of people are aware that brushing their teeth twice a day is recommended. This is something we have been told by dentists and parents from a very early age. Brush once in the morning and once in the evening in order to avoid the dentist. Well, that did not always work. I have the mental scars to prove it! The American Dental Association (ADA) has now replaced our parents in telling us how often and why we should brush our teeth. But, more importantly, they have emphasized that oral health is overall important for a person’s well-being and general health. They have even gone as far as to advise us that the size and shape of the toothbrush we choose to use, should be able to fit our mouths. The notion that there might be a precedent to suggest that people have done the opposite makes me giggle inside. The ADA is also kind enough to remind us to replace our toothbrushes every three to four months. When the bristles get frayed, their performance ability drops. In other words, they become too soft and incapable of removing all of the plaque and other food debris from the teeth. Brushing for 2 minutes, twice a day is the recommended norm. But, remember, you are brushing to remove food residue and plaque, not to make your teeth shiny. Too many people seem to spend 2-3 minutes brushing the front of their teeth with whitening toothpaste. In order to clear the bacteria from your mouth, you need to brush your teeth in and out. As a matter of fact, brushing your tongue can remove additional bacteria. Flossing is not a new concept by a long mile. Motor-powered water flossers have existed for over 60 years now. String flossing is older than most cultures in the world and it probably was part of Cleopatra’s daily hygiene routines. Right after she takes a bubble bath in goat milk. Unlike brushing, flossing is still viewed as a task that consumes too much energy. The thing about brushing while feeling tired is that you can do it halfway. You can brush for a minute, but quickly brush all of your teeth. Flossing does not usually work that way. If you only glide the string through half of your teeth, you end up feeling guilty about abandoning the other half of your mouth. So, even before you start flossing, you know you will have to do all of your teeth. And that discourages you from the start. The goal of flossing is the same as the goal of brushing – to destroy plaque buildup. These are nasty bacterial colonies that form in the darkest and most hidden parts of your mouth. From there, they lurk day and night to cause tooth decay. Flossing serves to remove food debris and plaque from within the tight gaps between teeth. These are places of dark magic and wizardly forces where your regular toothbrush simply cannot reach. These are also the spots where the most destructive bacteria likes to reside – dark, deep and full of moisture. In order to floss in a proper manner, you need to wrap the tooth in a c-shape. This is done in order to cover as much space as possible. 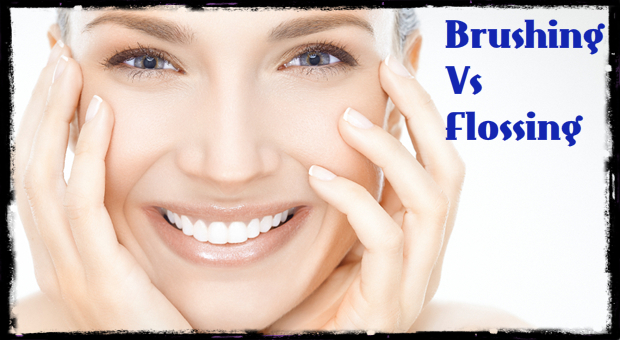 It is also performed from both sides of each tooth by moving the floss string up and down. This is the only way to remove plaque formations from the inner and outer parts of the tooth. Brushing and flossing sound pretty straightforward, at least in theory. However, recent research published in Clinical Oral Investigations shows the opposite. First, too many people neglect to brush the entirety of their teeth. People seem to concentrate the power of the brush only to the front end of their teeth. Second, floss is being used insufficiently. The majority of people think it is enough to quickly glide the string between one space in the teeth and move to the next. Stop debating if you should buy a toothbrush or string floss. Buy both, and start practicing both until they become daily habits. This way they will take less energy to complete.